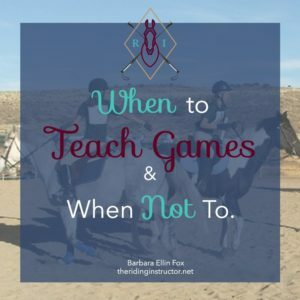 The Riding Instructor just came out with this excellent post about “When to Teach Games & When Not To”! She states it so simply and clearly, I wish I had made a post like it long ago, since half of this blog is about games. I have blogged notes about the difference between Practice, Progression, and Activity, but never focused on just when to use games or not. So Without further ado, I forward you to her blog post. Click the image below! They all go to the same lovely place. Thank you! I don’t regret, and I’ll keep it up, haha! I totally agree with you. I would want to add to her post an addendum about using games for riders with disabilities in particular, because I think they hold a special place for them regarding motivation, fun, and slipping in practice toward other developmental goals. I’m so glad to hear you’ve used the games I’ve posted, that’s so wonderful! Keep up the great teaching!